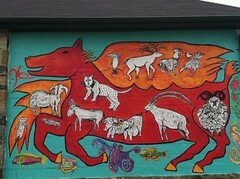 This collaborative mural was created in 2013 by Brian Dowdall, visionary artist, & Alison Spiesman, contemporary artist, on the back wall of the Rawlings Conservatory outbuilding. The five panels, "a satellite visionary experience," depict the wonders inside the Rawlings Conservatory through a fable created by the artists. You might have a scavenger hunt inside the Conservatory with components that are visually picked out from within the mural i.e. coconut palm or kio fish pond or blooming cactus, protea, etc. 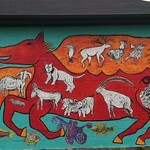 The 3rd, 4th & 5th panels are depicted through aboriginal dream time.